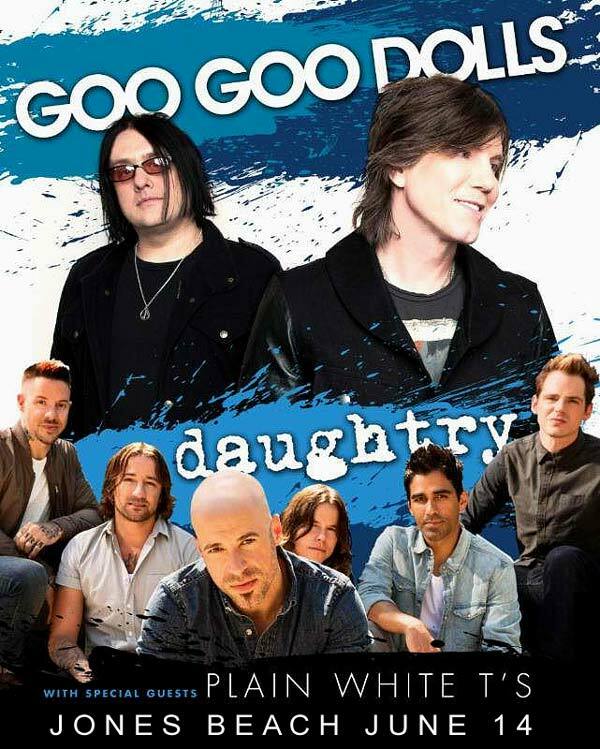 Daughtry and the Goo Goo Dolls are headed to Jones Beach this summer on June 14. Special Guest Plain White T’s are expected to do an acoustic set at the show that will give fans “an awesome night of American rock music,” according to a press release. The Goo Goo dolls have been on the road relentlessly over the last year supporting their latest album, Magnetic, which hit #8 on the Billboard Top 200 and sold over 29,000 copies in it’s first week of sales. The album registered at #28 on TheRockRevival.com’s list of the Top 50 Rock Albums of 2013. Daughtry are touring in support of their latest effort, Baptized, which debuted at #6 on the Billboard Top 200 a little over a year ago. The band is currently on a European tour, which includes a sold-out U.K. run. Plain White T’s released an EP, Should’ve Gone To Bed, in April of last year. The band is currently working on their seventh studio album, American Nights, which is due out later this year. Goo Goo Dolls are one of the greatest artists of their generation. The band is certainly one of the most accomplished acts of all time, with 14 Top 10 Radio hits, more than any other artist in the history of the Hot AC format. Their last five albums have all charted in the Top 30 on the Billboard Top 200. Their triple platinum 1998 release, Dizzy Up The Girl, spawned four massive hit singles, including “Iris”. The band’s biggest hit, it spent nearly 12 straight months on the Billboard charts and held the #1 spot for 17 consecutive weeks. John Rzeznik has been honored with the Songwriters Hall of Fame Hal David Starlight Award. Throughout their career, they have been nominated for four Grammy Awards, and are the only artist to have three songs on Billboard’s “Top 100 Songs from 1992-2012″ including the #1 slot, for “Iris.” This past summer, Goo Goo Dolls mounted a massive summer co-headlining tour with contemporaries Matchbox Twenty. Multi-platinum recording artist Daughtry has scored four No. 1 hits, garnered four Grammy nominations, won four American Music Awards, sold over 8 million albums and 18 million singles worldwide, and sold out concerts around the world. Daughtry’s self-titled debut was the fastest-selling rock debut in Soundscan history and its follow up, Leave This Town, marked the quintet’s second consecutive No. 1 album. Daughtry’s third album, Break The Spell, was certified gold within four weeks of its release. Daughtry’s latest single ”Waiting For Superman,” from the band’s new album Baptized, is Top 15 at AC. In addition to recording and touring the globe, front man Chris Daughtry is also dedicated to using his position to raise awareness about a number of charitable causes including an ambassadorship with DC Comics and its We Can Be Heroes campaign. Goo Goo Dolls are out in support of their latest full-length, Magnetic, while Daughtry are touring on the back of their current release, Baptized.